Here’s what happens when creative types have difficulty sleeping… their bedroom set invariably gets an interesting makeover. Some of the most interesting beds stray from normal conventions and show a surprisingly rare creativity. Circular beds are cool, but circular beds suspended from the ceiling are even cooler. 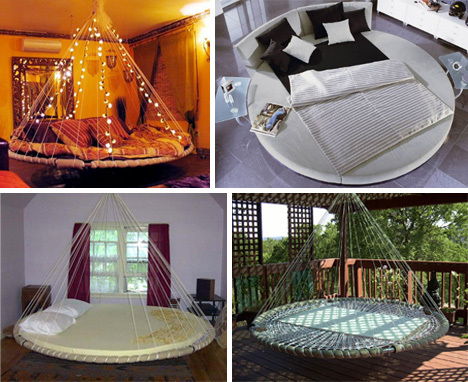 The so-called Floating Bed is an interesting product that can be hung inside or outside, depending on one’s desire. They are a bit more expensive than a conventional mattress, but for good reason! Look how well they complement a living room, bedroom, and porch. The non floating circular bed is just there to compare how drab the Floating Bed makes even an unconventional mattress seem. 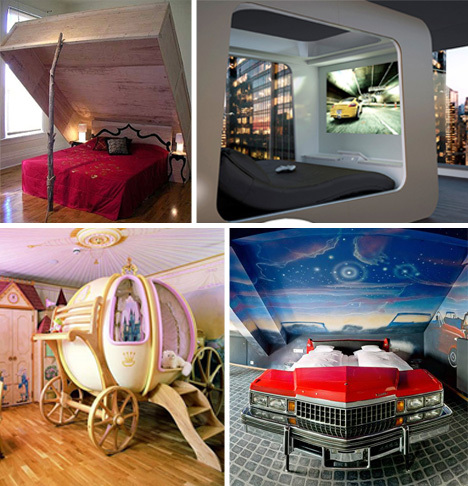 Car lovers will instantly understand the appeal of these beds. Whether one creates a vehicle bed for a child who wants to be an astronaut, or simply wants to take the old Mercury for a spin (notice the working headlights), this is a creative way to go. 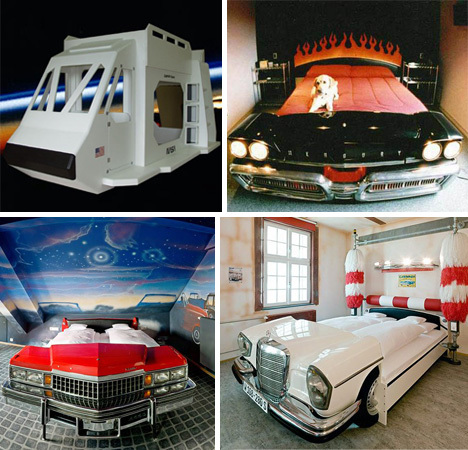 The V8 hotel in Germany holds the honor of having some of the coolest beds around, including the Mercedes Benz going through a faux car wash, and a 70’s Cadillac sitting out under the stars at a drive-in theater. Some beds are stranger than others. We like to call these artistic. For example, this lovely bed designed to look like a trap, or this furry dog pod bed meant to entertain a pooch in style. 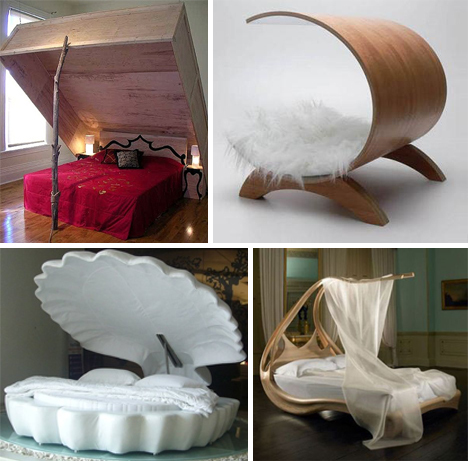 The elegant and organic looking wooden bed seems very conventional once once examines the terrifying clam bed, for those who want to actually become pearls. A lot of parents like to incorporate animals in the design for a kid’s room, but those inspirations typically stay on the walls. Here are two examples where that didn’t happen. 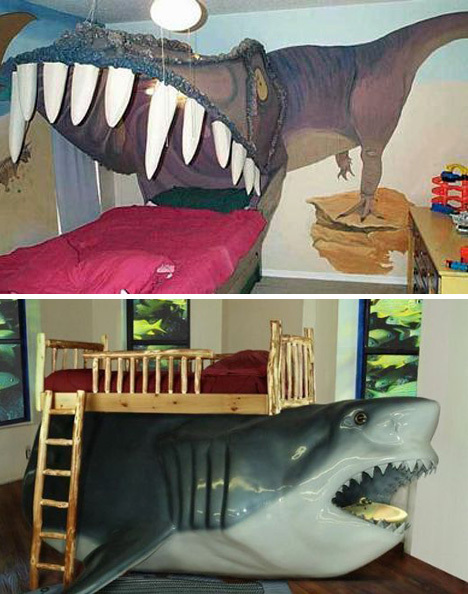 The home-made dinosaur bed could be a bit terrifying for the youngest kids, but most children would likely find it awesome. It’s hard not to like the shark bed, which definitely seems to match the window decor. 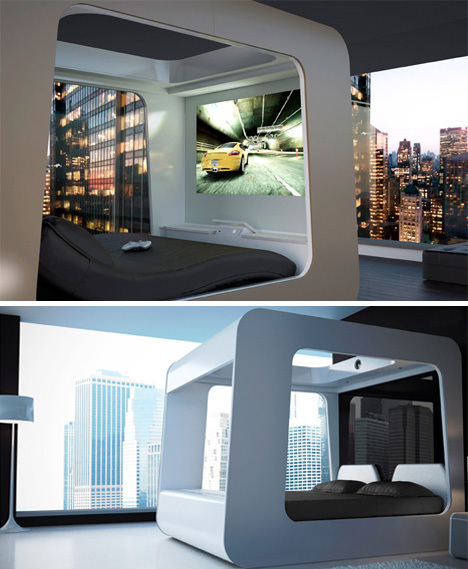 The futuristic HiCan bed has some amazing features. Beyond its modern look, it also has a built in projector and video game console. It looks like the ultimate in sophistication, even though it’s actually the ultimate man-cave. A kid’s room should be entertaining and fun, right? 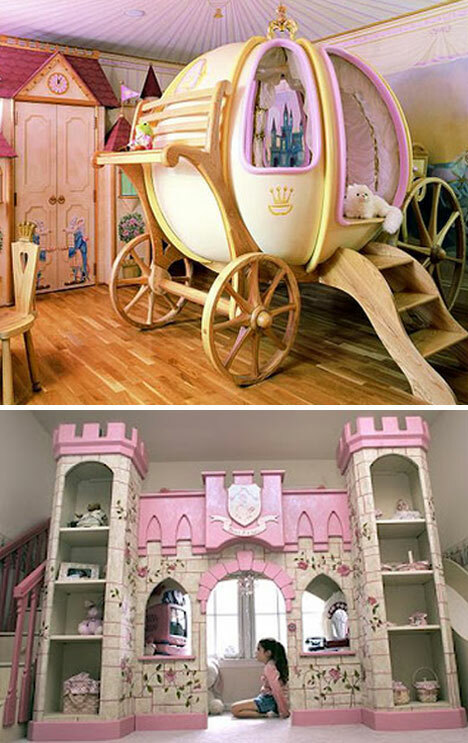 Here are two girl’s bedrooms that take the princess theme to a new level. The first is a carriage straight out of a fairy tale, while the second is built as a castle / playroom with a bunk bed on top.